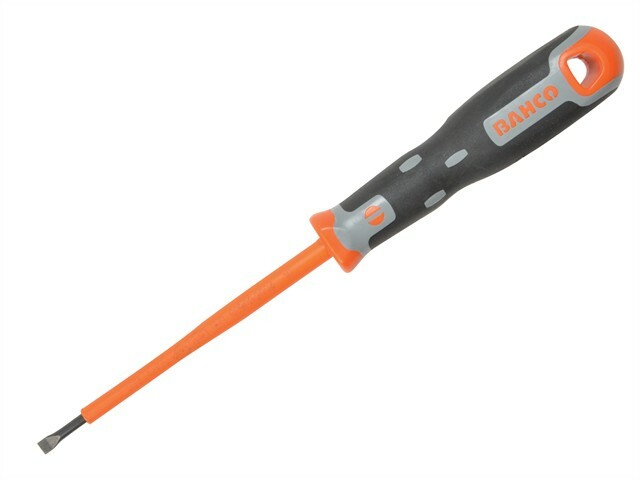 The Bahco Series 033 Slotted Tip Insulated Screwdriver for voltage work up to 1,000 Volts. The three component handle is made from Thermoplastic Rubber and Rudolit (2) and is double shaped for use with both hands (in large sizes and in proportion to the dimensions of the shank). Its large surface allows optimum comfortable grip and maximum torque. The hole in the handle allows the insertion of a T bar for added force transmission and for hanging up the tool after use. The Molybdenum-Vanadium shank combines great hardness and toughness. It is fitted with a black tip for added protection, precisely machined.